This traditional AynaKetch Gulet (Gulet-type with mirror aft), gives a lot oft space, specially when groups are small. With its 3 cabins she is meant for max. 8 guests (when with kids), because the master cabin has two double beds. This boat is also an ideal host for a honeymoon couple. High comfort and best service ist the aim of owner and captain Ugur. Launched just in the year 2000, he has already invested in air-condition and a second mast, because he is a passionate sailor. Crew: 2/3 (Captain, Chef, Sailor) in separate crew quarters. Language: Turkish, English. Full-Board including Breakfast, Lunch, 5 o`clock Tee or Coffee, Dinner will be provided for 40 Euro per Person / per day . There is nearly none of the gullet charter-companies who tells you the truth about the use of air-conditition on Gulets. Yes, M/S ADMIRA has AC and you switch it on indivually. But on a boat the AC can only run when the generator is on, or in a harbor when connectet to 220 Volt. Mainly you are in anchorbays, often next to a neighbor, who doesn't like the noise of your generator and you wouldn't like it either during the night for example. 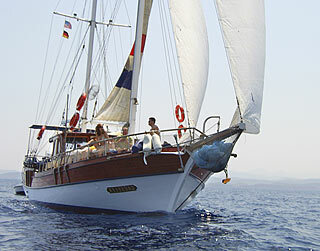 In Private Gulet Charters, the gulet is rented privately. There is no fixed itinerary and it is possible to board or leave the yacht in any harbour, such as Bodrum, Marmaris, Göcek or Fethiye. Prices change depending on duration and the month. The M/S CAGSELEN meets international safety regulations including life jackets, fire extinguishers and alarms.